Stability, shock resistance and high seal is efficiency is what we offer when it comes to the Pneumatic Pet Strapping Tool. A highly unique piece of machinery, this tool allows your work to be done easily, without any strain, and helps increase your efficiency by many folds. 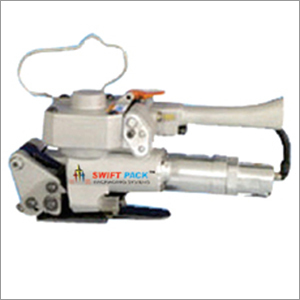 Made with the latest technology, Shri Vinayak Packaging Machine Pvt. Ltd has made a highly reliable product for the transportation industry and we are giving this at a very reasonable price. Catering to the requirements of our clients for 15 years, our company believes in fabricating products of the most finest quality. Made with the best of resources, this Pet Strapping Tool also has a new sleek design which gives you a superior grip. Any technical assistance or inquiries would be taken care of by our group of highly trained professionals.